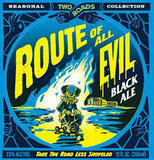 A hefty Black Ale with profound malt and hop complexity. Neither Stout nor Porter, this beer is full-bodied, bold and black with flavor characteristics of dark chocolate, mocha, molasses and dark fruits balanced by piney citrusy notes of Pacific Northwest hops. Full-bodied and uncommonly satisfying at 7.5% alcohol.